The more I get to know my fellow SF writers, the more I realize we have in common. Like me, a goodly number of them also enjoy needle craft, be it sewing, knitting, crochet, cross-stitch, quilting or fancy work. It’s hard to sew and write at the same time, and when I’m deep in the throes of book construction, my needlework suffers. I was delighted to follow my friend Pippa Jay’s progress in making her own Jedi tunic as she shared photos and agonized over the process. If I couldn’t spare the energy to sew my own projects, I could vicariously enjoy hers. In honor of National Sewing Month, I asked Pippa if she’d share her project here. She graciously agreed. After seeing Star Wars: A New Hope on TV at the age of eight (and developing a huge crush on Luke Skywalker too), I wanted to be a Jedi. I mean really, really wanted to be one. I would stare at things in my bedroom trying to persuade them to move, and be bitterly disappointed when they didn’t. And the whole ‘Do or do not, there is no try’ from The Empire Strikes Back convinced me it was never going to happen. Thirty something years on, and I’m trying to be a Jedi again. Oh, not the making-things-move-with-my-mind stuff, but with the outfit. I’m off to Worldcon next year (LonCon 3, yahooo!). I *could* go as one of my characters, but since Quin would pretty much wear what I would (or should that be I would wear anything that she would?! ), and no one is going to know who that is anyway, I thought no. This time I’m going to be a Jedi like my…no, wait, I’m just going to be the Jedi I wanted to be. Since I’m not going as a specific character but just aiming for the general look, I’m not going for 100% accuracy on the details so please don’t Force choke me for it! So, I started with a bought pattern (Simplicity 5840) and a bundle of cheap fabric from my local charity shop (a pale sandy colour and a more mid brown/tan). The pattern came from ebay, and there are still some available on there if you want to get yourself one. Now, I’m no expert at sewing or at following patterns – I’m self taught and don’t know what a lot of the technical terms mean. I can usually figure things out though. 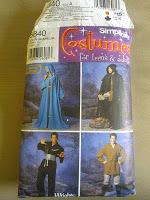 The pattern for the tunic (image bottom right of the pattern) comes in unisex and multiple sizes – Extra Small to Extra Large. So I dutifully measured my chest/bust size and came out in the gap between Medium to Large. Knowing how these patterns tend to be on the generous size (BTW, because this is a multiple size pattern, there’s no hem allowance included unless stated, and I didn’t find that out until AFTER I cut it. Luckily for me, the sizing is VERY generous and missing the hem allowance didn’t do any harm overall) I went for Medium. The pattern suggested lightweight linens or silky type fabrics, so I went for the lighter of the two I had – it looks and feels like chamois leather on the outside, but is kind of satiny on the inner side, and light with a slight bit of stretch to it. No idea what the fabric actually is. Then the wonderful job of pinning on the pattern and cutting it out. 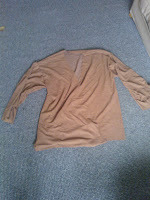 Then stitching the sides and shoulders of the main body, and attaching the sleeves. 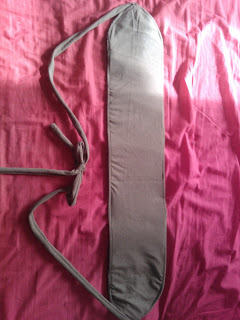 Next was sewing up all the seams, including leaving small slits up the sides and generally tidying up the ends. 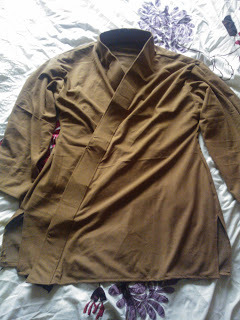 After that comes the edging for the collar and cross-over opening of the tunic. This required four long strips of material wrapped around heavyweight interfacing (I didn’t know what that was until hubs went into a craft shop and asked – it’s stiff fabric that does things like make collars stand up straight or gives a more solid structure to your fabric). 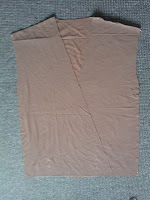 The brown fabric had to be stitched around this and then attached to the edges of the tunic to give the band that goes around the neck and along the cross-over flaps. Finally, the pattern has a belt with it. Again, this requires stitching fabric around a broad piece of interfacing and adding ties. I think the belt is a bit too wide for me (the short factor again) so I may make a thinner one than the pattern suggested. I’m also looking at a replica Anakin belt, simply because I want something to hang my lightsaber from, and I’m not quite sure how to attach one to this fabric version. However, I’d wear this version under the leather belt anyway, since a lot of the costumes from the film do so. 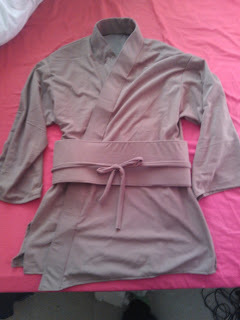 But this is the complete tunic for now. In the meantime, in the spirit of National Sewing Month, I have a little contest for you. It’s been suggested that I should have a Jedi name to go with my outfit. So, I’m including a poll for you to vote on with some Jedi names (using a random name generator) and a few suggested names from Twitter, but you can also add your own suggestions. And I’m going to do a giveaway. I’ll send one Jedi patch (see picture) to the person who either makes the suggestion I like the best, or tells me which name they voted on in the comments with a clever reason why I should use it. Have fun! Vote for my Jedi name!